Project Shadow 2 is a hack of Sonic the Hedgehog 2 for the Sega Mega Drive by JohnnyUK. 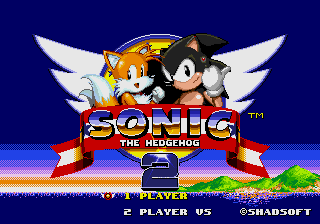 The "2" in its title does not signify that this is a sequel of another hack, but instead simply signifies that it is a Sonic 2 hack. You have to search for an in-game password to use to obtain the Bonus Rom. This page was last edited on 15 April 2018, at 15:26.